If you’ve soaked up your share of sun and are looking to soak up some Hawaiian culture, you may want to consider a trip to the Bernice Pauahi Bishop Museum. That’s because the museum is home to two new exhibits, “Dinosaurs Unleashed,” and “Nani I Ka Hala: Weaving Hawaii.” “Dinosaurs Unleashed” is on display from February 28th to September 7th in the Castle Memorial Building, and “Weaving Hawaii” is on display from March 28th to July 27th in the J. M. Long Gallery. “Dinosaurs Unleashed” includes smaller exhibits and more than a dozen life-like animatronic dinosaurs, each with an educational plaque on which you can read-up on their feeding habits and habitat. Upon entering “Dinosaurs Unleashed, ” visitors come face-to-face with an enormous replica of the ever-popular “tyrant lizard” or Tyrannosaurus rex. Step to the right, and you come upon a giant Tyrannosaurus rex head, perfect for a photo-op. But, the T-rex is hardly the only dinosaur on display. Visitors can learn about some of the other reptiles of the Mesozoic. They include the Maiasaura, “caring mother lizard,” with her baby and a nest of eggs, the Deinonychus, and the Tenontosaurus. Interactive stations and activities at the various exhibits highlight how these animals flourished in their respective environments. Hands-on learners and aspiring paleontologists will have the opportunity to test their mettle in a dinosaur dig, create colorful bone imprints, and control a robotic dinosaur skeleton, just like those featured in the exhibit! 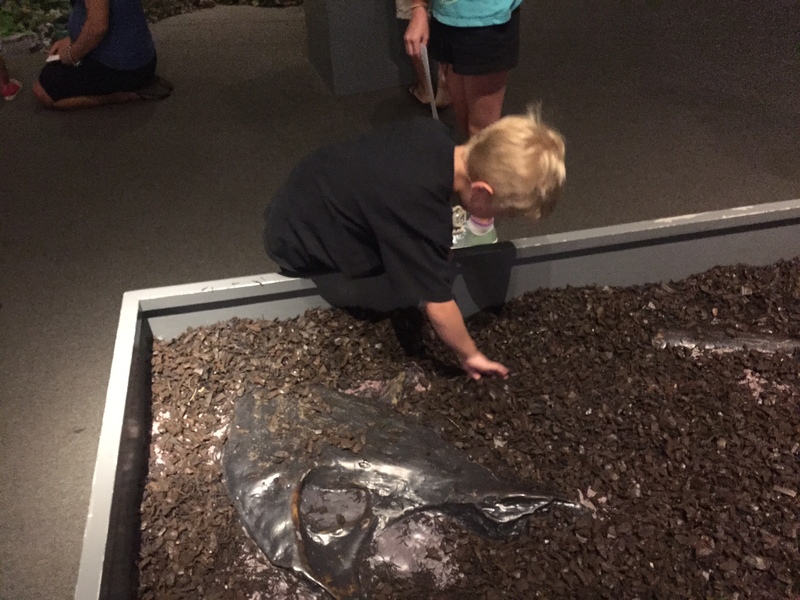 The writer's son digs for dinosaur bones in the exhibit. While many people know of the close evolutionary relationship between dinosaurs and birds, few people know that Bishop Museum has worked painstakingly to document these other kinds of ancient species that once lived in Hawaiʽi and other areas of the Pacific. Their paleontology collection contains 30,000 cataloged and 10,000 backlogged specimens of sub-fossil bird bones, many of which are on loan to the Smithsonian Institution. Experts from both institutions are able to study this exclusive collection and paint a picture of a Hawai‘i long before Western contact. “Nani I Ka Hala: Weaving Hawaii” is on display in the J. M. Long Gallery and addresses the vital need to collect, share, and perpetuate this tradition as part of Hawai’i’s heritage and vibrant living culture. The traditional Hawaiian practice of weaving hala (pandanus, Pandanus techtorius) has been a cultural force throughout time, from its functional roots in precontact Polynesia to its widespread recognition today as a celebrated visual art form. The beauty and significance of hala is woven throughout Hawaii’s history and throughout this exhibit. In ancient times, the sails of voyaging canoes were plaited of hala, and utilitarian hala baskets and mats were commonplace. The introduction of foreign items that replaced Hawai’i-made mats and baskets encouraged weavers to further their creativity, leading to a distinctive and truly exquisite Hawaiian style of hala hats that are coveted and treasured as fine art. The two exhibits are included with admission to the museum.